Groundwork Somerville offers year-round garden-based education to children from kindergarten to eighth grade, taking place in all of the city’s eight public elementary and middle schools, a public charter school, and a public library. In both in-school and after-school programs, children learn to plan, plant, tend, and harvest from their own school gardens, and even cook with food they have grown. The school gardens have all been built with volunteer labor, and most are located on sites that were previously paved or abandoned. In addition to learning biology, chemistry, math, English, arts, and social studies in a practical, hands-on laboratory, students participate in fun activities to get their minds thinking, creativity flowing, and bodies moving. Recent research shows that Groundwork Somerville’s school garden programming, in combination with revamped school lunches, a stronger focus on physical activity and healthy eating, and other public health efforts, has been effective in reducing child obesity rates in the Somerville Public Schools. Our Healey School Garden received recognition from the First Lady and her “Let’s Move” Initiative! Five students from the Healey, including former “garden club” members, were selected to go to D.C. to help plant in the White House vegetable garden. Executive Director Chris Mancini accompanied the group when they returned to help Mrs. Obama harvest what they’d planted! 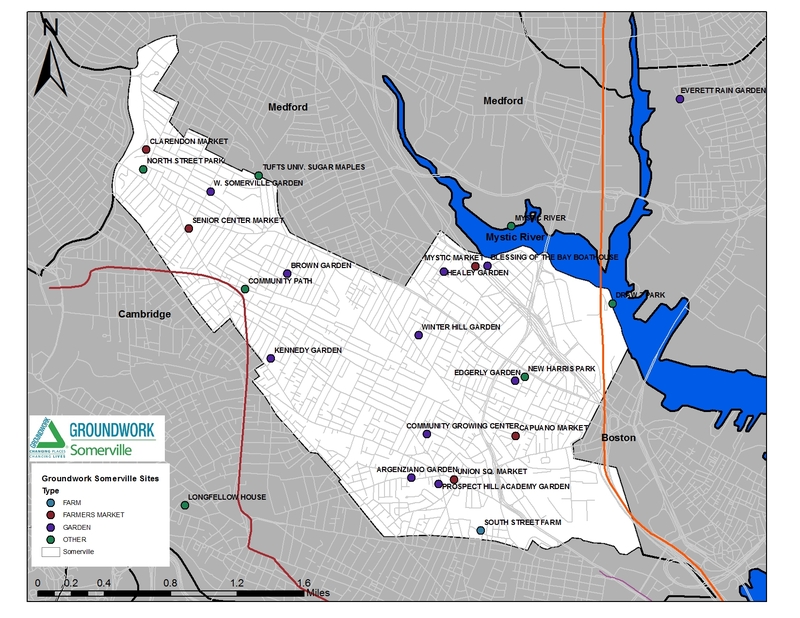 Check out our schoolyard garden sites: view Groundwork Somerville sites map! Learn about our accomplishments from the 2012-2013 school year! Dr. Albert F. Argenziano School at Lincoln Park – 290 Washington St.
Arthur D. Healey School – 5 Meacham St.
Benjamin G. Brown School – 201 Willow Ave.
East Somerville Community School – 50 Cross St.
John F. Kennedy Elementary School – 5 Cherry St.
Edgerly Center (Next Wave and Full Circle Schools) – 8 Bonair St.
West Somerville Neighborhood School – 177 Powderhouse Blvd. Winter Hill Community School – 115 Sycamore St. Prospect Hill Academy Lower Campus – 15 Webster Ave.
Garden Workshops: Do you offer programming to elementary or middle school students? Do you want to enrich your children’s programming with a Groundwork Somerville Garden Club or Workshop? Click here to find out more. Garden Consulting: Are you looking for help starting a school garden in your community? Groundwork Somerville offers consulting services to garden advocates in neighboring cities hoping to start or improve their own vibrant schoolyard garden programs! Click here for more information about our consultation services. Watering Heroes and Garden Gurus needed! Check out our Volunteer Page to get involved in maintaining our school gardens.